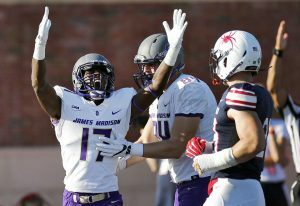 Richmond, Virginia – The James Madison Dukes returned the opening kickoff 93 yards and never looked back in their dominant 63-10 win over in-state rival Richmond. As returner Juwon Hamilton cut left and hit the hole he went untouched to the end zone. The Spiders outplayed the Dukes for the rest of the first quarter, but could only must a field goal on their first offensive possession of the game. The Dukes took control of the game in the second quarter, scoring 28 points. Marcus Marshall scored on a 15 yard run to cap an eight play, 78 yard drive to give the Dukes a 14-3 lead. The game’s momentum completely shifted on the next Spider possession. Kevin Johnson and Aaron Dykes marched the Richmond offense to the JMU nine yard line. On second and goal from the nine, Johnson threw a fade intended to Jarmal Bevels, but the pass was intercepted by Jimmy Moreland at the goal line. Moreland did the rest and returned the ball 100 yards for a touchdown, giving the Dukes a 21-3 lead. Richmond would add a touchdown sandwiched between two Ben DiNucci touchdown passes, one to Kyndel Dean and one to Riley Stapleton. The interception return for Moreland was his 17th career interception and 6th career pick six. Moreland has returned an interception for a touchdown in three straight weeks. His 18 points on those returns is one more point than the 17 points the Dukes have allowed over the same three game stretch. The second half was more of the same for the Dukes. DiNucci hit Dean for a touchdown for the second time in the game. It went from bad to worse for Richmond, as Aaron Dykes fumbled the ensuing kickoff which was recovered for the Dukes by Percy Agyei-Obese. On the next play, Cardon Johnson ran in for a 10 yards score. The Spiders turned the ball over on their first three possession of the second half, and never amassed a drive in the second 30 minutes that went more than six plays. The Spiders amassed only 55 yards of offense in the second half after amassing 282 in the first half. The Dukes kept coming, taking advantage of Richmond’s inability to move the ball down the field. Marcus Marshall scored on a 55 yard run to extend the Dukes lead to 56-10 at the end of the third quarter. The final margin came on a 71 yard catch and run when Gage Maloney connected with Jake Brown. The 63 points is the most the Dukes have ever scored in a run game and the most they have ever scored against Richmond. The 53 point margin of victory was also the largest margin in the history of the rivalry. The Dukes extended their winning streak against CAA teams to 23 games, including playoffs. James Madison is yet to lose a conference game under Mike Houston. James Madison rolled to 543 yards of total offense, 343 through the air and 200 on the ground. Mike Houston and his staff always appear to make the right adjustments at halftime, and that’s where the Dukes are usually able to put teams away. Against Richmond, the Dukes had 293 second half yards even with the short field after forced turnovers. This week, Richmond has another home game where they will welcome back former coach Danny Rocco and the Delaware Blue Hens. The Dukes return to Bridgeforth in a top 10 FCS matchup against Elon. James Madison is entering the portion of their schedule where they will have to be at the top of their game each week to keep their CAA winning streak going. After Elon, the team travels to Villanova – traditionally a tough place for the Dukes to play- before Stony Brook comes to Bridgeforth the following week.